Ultiworld reporters were scattered around Regional tournaments around the country and compiled their thoughts on a (surprisingly?) favorites-dominated year. As many of our staff were playing for club teams, we were not able to cover every tournament, so please feel free to submit a short recap of your tournament to be added to this collection. A chalk finish belies the excitement that took place on the fields in Milford, DE, as Mid-Atlantic Regionals lived up to its three fire emojis and then some. Between pool play and the championship bracket, only one upset involving a team seeded higher than 7th took place, with 6th-seeded Dub Club toppling 4th-seeded Bang! in the “Battle for West Chester” quarter-finals. And while Philadelphia AMP held their top seed to clinch the region’s lone bid to Nationals, it was far from a formality as they faced scares in both their semi-finals against Dub Club and the championship game against 2nd-seeded Pittsburgh Alloy. Despite Regionals being moved back to late September, players faced the hottest conditions this tournament has seen in perhaps a decade, with temperatures reaching mid-80s both days and the unforgiving turf fields adding another 10 degrees. This proved advantageous for AMP, who pride themselves on their conditioning and have unquestionable depth at every position. Their discipline and tenacity in late game scenarios were unmatched and ultimately fatal to their opponents. Those late game scenarios may not have been as exciting were it not for numerous first-half miscues. After missing a handful of break opportunities againts Dub Club, AMP’s offense became stagnant, with deep options being looked off for lateral movement. Short field errors yielded two consecutive breaks, and suddenly AMP was down 7-5 with Dub Club threatening to earn the double break for half. Philadelphia finally got their bearings and rattled three in a row to hold serve through the break. Dub Club continued to play electrifying offense and stifling defense throughout the second half but ultimately could not generate enough turnovers against a stabilized AMP offense, as the teams mostly traded holds before AMP won 14-12. Lindsay McKenna and Chris Pokorny were standout players for Dub Club’s offense, getting lots of touches while making jaw-dropping plays when necessary. 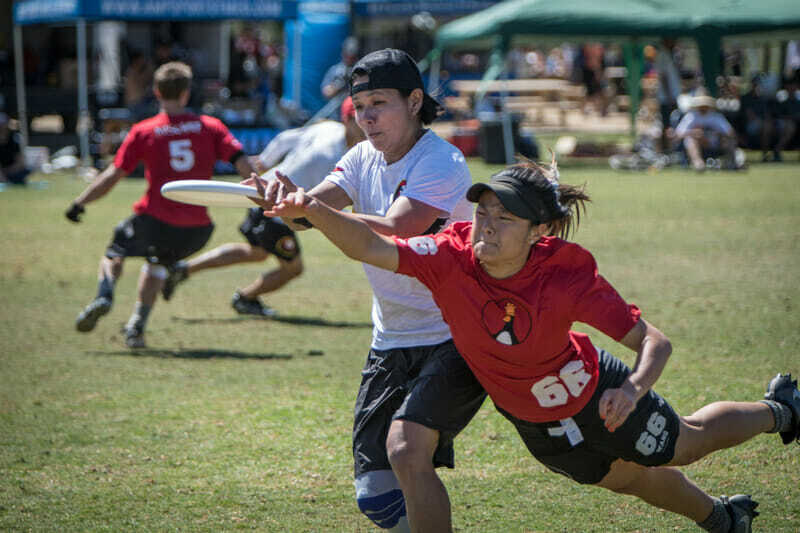 In the other semi-final game, Alloy earned several breaks early on against Washington, DC Ambiguous Grey and cruised to a 15-9 win. The championship game drew a sizable crowd and lived up to expectations, as AMP and Alloy both put on displays of throwing prowess and athleticism. Calvin Trisolini was everywhere for AMP, throwing or catching all four of their first half holds. Molly Moore seemed to get open at will for Alloy, and Christie Lawry did a bit of everything, including a cross-field IO flick huck that left fans from both teams swooning. Despite opening the game with two breaks, AMP reverted to commiting unforced turnovers that kept Alloy in the game, epitomized by a first throw turf at 7-7 (deja vu from last year’s semi-finals) to allow Pittsburgh to keep the game on hold at halftime. But just as it happened in their previous game against Dub Club, the Philadelphia offense got its footing in the second half. The defensive pressure increased as well, with clutch blocks by Allsha Dixon, Sarah Johnson, Ryan Flamberg, and Steve Rosso. AMP ended the game 14-10 on three straight breaks to earn the region’s sole bid to Nationals. Other standout players for Pittsburgh were Kenny Furdella and Alexander Thomas. Michael Ing was dominant in the air for AMP. In the 5th place bracket, Lancaster Distelfink, who lost narrowly to Ambiguous Grey 14-11 in quarter-finals, defeated Princeton Jughandle and Bang! to earn the last spot in the Select Flight, along with Alloy, Grey, and Dub Club. Although Dig is clearly on the rise, Boston is still Ironside’s town, as the defending National champions romped through Northeast Regionals and past Dig 15-10 in the title game. The game was not close: Dig did not get a single break and the Ironside offensive line made chances extremely scarce. Dig had already qualified for Nationals by winning their semifinal against PoNY, but don’t be mistaken: they were absolutely playing to win. Dig went on to soundly defeat Toronto GOAT 15-11 in the 2/3 game after GOAT clinched a bid with a win over PoNY in the previous round. Dig is clearly a dangerous team with a Player of the Year nominee in Ben Sadok, their O-line maestro. Keep in mind that Jeff Babbitt will rejoin the team in Sarasota after playing a bit for them at New York Invite. He will give their D-line an immediate boost. GOAT, led by fine play from Andrew Carroll, has shaped up into a solid team, but clearly one in transition. With Mark Lloyd suiting up for Bravo, their long-time head coach Scott Hastie departing this season, Isaiah Masek-Kelly sitting out this season, and stalwart veterans like Jeff Lindquist starting to lose a step, it’s a bit of a fresh start for the Toronto’s program. Getting back to Nationals after a brutal loss to Dig last year (which clearly was no fluke) is an obvious success, and they will start to shape the team around up-and-comers like Mike MacKenzie, Brett Tan, and Ben Burelle. They’ve got a brutal pool at Nationals (Ring, Ironside, and Patrol); getting to quarters would be an achievement. New York PoNY, who lost to GOAT 15-10 but then easily defeated an exhausted and outmatched Montreal Mockingbird in the game-to-go, remains a bit of a mystery. Despite significant talent upgrades, particularly on their offensive line with players like Sean Keegan, Ben Jagt, and Sam Little, they simply have not found a consistent rhythm. It’s not exactly a disappointment to finish behind three really good teams in Ironside, Dig, and GOAT, but they were not competitive in their losses at Regionals. Perhaps a positive for PoNY is drawing what could be a great pool for them (Sockeye, Machine, Florida United). While they won’t have realistic hopes of winning the pool, they have a win in hand against Machine from the regular season and avoiding Dig or GOAT in the three spot (and getting an untested Florida instead) is favorable. From a bird’s eye view, Northeast Regionals went almost exactly to expectations. Ironside is once again a title contender (finally at full strength, they looked very impressive), Dig is a step above where they were a year ago, GOAT is solid but in flux, and PoNY needs a year or two of roster consistency to put things together. So Boston Slow White, Connecticut Metro North, and Boston Wild Card qualified. Ho-hum, right? Metro North was a point away from disaster in a Nationals-qualifying game against New York XIST, ultimately winning on double game point in a thriller (available for Full and Plus subscribers). The game swung back and forth multiple times, and a late Callahan by XIST’s Izzy Bryant seemed to swing momentum in XIST’s direction. But Metro, a finalist at 2016 Nationals, dug deep and managed to hold on DGP to qualify. XIST made it to that game after getting a shock win over Wild Card in quarterfinals [WATCH]. That relegated Wild Card to the third place bracket with no room for error. They played two nailbiting elimination games back-to-back against New York’s The Feminists (11-9) and Toronto UNION (12-11) but managed to emerge into the game-to-go where they faced an outmatched Boston League of Shadows, who upset a mentally-crushed XIST in the previous round. They claimed the final bid with an easy 15-6 win. Slow White also had to dodge some scares, though they were never in a position to miss out on Nationals. They beat Metro North 13-12 in a crossover after pool play to determine bracket seeding and then had a challenging game-to-go against UNION, winning 15-13, though they controlled that contest. Thanks to strong regular seasons, Slow White and Wild Card get the four and six overall seeds at Nationals, while Metro North comes in all the way down at #14. That will make them a highly unpleasant sight for AMP, Blackbird, and Toro in Pool B. In some ways, given all of the extremely close games, upsets, and “almosts” at Regionals, it’s quite surprising that the three teams expected to qualify ultimately did so. Perhaps that shows just how important knowing how to win can be when the crucial final points are played. Everything went (pretty much) to chalk. It was very, very hot. #1 seed Brute Squad couldn’t be touched all weekend. BENT and 6ixers each took them to 15-8, but Boston was clearly the top team in Devens. It’s time to stop talking about the roster turnover on Brute because they’ve successfully distributed the workload across their bench. Just like last year, BENT came out firing in the first round of pool play on Saturday morning. They matched up against the 6ixers, who had to adjust to defend the hucking game into the second half. Toronto held control of the game until the end, but BENT’s momentum was undeniable. Because there were only two bids to the Club Championships, there were plenty of opportunities for teams to sneak through the back door into the second place final. That opportunity didn’t come without consequence though, the road to the second place final meant eight games in the blazing heat. As predicted, it ended with the third and fourth seeds, Siege and BENT, playing into the last spot. Siege went into Regionals as the higher ranked team, but BENT edged out the narrow 13-11 win to carry on. However, they seemed to empty the tank in this game and they couldn’t maintain the pace in the game-to-go, where the 6ixers took the game 15-6. The distinction between the top four and the bottom six in the tournament was definite. The closest score seen was a feisty match between BENT and Brooklyn Book Club, which was time-capped at 12-7. One of the biggest struggles for the bottom six teams was a combination of the heat and low numbers. The team that was possibly more clearly affected by this was Savage–they were able to generate excellent movement from their handlers getting into power position, but they really could have used a few extra pairs of legs to make a believable run against teams in their pool. Did we already mention how hot it was? The top four ranked teams from the Northwest (Riot, Traffic, Underground, Schwa) qualified for Nationals, but not without some drama. Tournament 3-seed Underground battled through the 4th place bracket to claim the final bid after the Vancouver Sneaky House Hippos upset them on Saturday and nearly beat them in the 4th place finals. Seattle Riot opened up shop on Saturday and took care of business: their biggest challenger was Schwa, whom they beat 15-10. With their spot in Sarasota already secured, Riot beat 2-seed Traffic in the final 15-13 to become the Northwest Regional Champions. Vancouver Traffic played closely with all three of the Northwest’s top contenders. They showcased their offensive polish on Sunday against Riot and then against Schwa in the 2nd place final. Rachel Moens and Catherine Hui were once more standouts on the Vancouver roster as they drove the disc downfield with force. Portland Schwa and Seattle Underground managed to avoid each other at Northwest Regionals this year. Schwa held seed in their pool and defeated the Sneaky House Hippos on Sunday to qualify for Nationals. Schwa’s speed and dynamic offense caused problems for everyone in the Northwest region, and their performance in the 2nd place final with Traffic foreshadows a strong team come Sarasota. Seattle Underground took the path less desired to their bid. They lost to the Sneaky House Hippos on Saturday, and then they fell 10-15 to Traffic to end pool play. Underground had to outlast Seattle Soul and Salt Lake City Elevate in the 4th place bracket before meeting the Sneaky House Hippos once more. The Hippos went up 3-0 early in the game. Underground worked hard to sync their offense, and they battled back to take half 8-7, and eventually the game, 15-12. #3 Seattle Sockeye stayed in control throughout Northwest Regionals, rarely challenged at any point in the tournament. Relying on relentless handler defense and fast movement off the turn, Sockeye dispatched Portland Rhino 15-9 in the final, on the back of five straight breaks in the first half to take the lead 8-2. Seattle seemed to let off the gas a bit in the second half, but the game was already well in hand by then. Portland, fresh off a double game point victory over Vancouver Furious George, had success working the disc downfield in smaller chunks of yardage, but Sockeye’s defenders constantly pressured the handler resets and the throwing lanes, forcing Rhino to throw into smaller and smaller windows, eventually earning turns and pushing the pace on the break. Sockeye rarely looked challenged throughout the tournament, and the final was no different, with Trent Dillon, in particular, harassing Rhino’s handlers into several unforced errors to help Sockeye take control. Dylan Freechild kept Sockeye moving on offense. #1 Seattle Mixtape and #4 Seattle BFG held seed and wrapped up their bids to Sarasota with some dominant performances throughout the weekend. Neither team seemed challenged until their matchup in the final, with Mixtape prevailing 15-12 thanks to some precision deep looks and athletic defense. Several exciting individual matchups were on display in the final, with the downfield battle between Mixtape’s Evan Klein and BFG’s Kieran Kelly in particular standing out. BFG’s Kate Kingery shadowing Mixtape’s Drew Johnson was also a fun matchup to watch, highlighting both their familiarity with one another, thanks to their time as teammates on Seattle Riot, and their importance to their teams. The game stayed close throughout, with BFG taking half 8-7 with several breaks on both sides. In the second half, however, Mixtape started to pull ahead with some big throws from Bert Abbott and Paige Kercher. BFG dropped into the game to go against Boise BoyShe, and the Idaho team kept pace with BFG throughout the first half. BFG took half 8-7, and ramped up the defensive intensity to pull away and take the second bid to Nationals, 15-10. The women’s division almost played out exactly as expected. Molly Brown and Showdown dominated the other women’s teams on Saturday: Dallas Maeve was the next closest competitor. Showdown and Molly Brown met in the second round on Saturday and the game was rather sloppy on both sides. Molly Brown managed to keep a substantial lead the entire game and come out on top 13-5. Again on Sunday, the early games played out as expected. Showdown met Molly Brown in a finals rematch, a game that most expected to be an easy win for Molly. But Showdown came out firing early and put Molly Brown on their heels. Denver would never make up the breaks that Showdown’s D-line earned early. Showdown was in the lead the entire game and controlled the contest to win 15-13 in what was probably the biggest upset during club regionals this year. – Conditions on the San Diego fields were great, a good taste of what’s to come at Nationals in 2018/2019. Winds were present but infrequent. Most often it was a crosswind. – Fury never really struggled with their competition. Teams would trade with them for a short while but the moment that Fury developed their rhythm, they were impossible to stop. The story at Regionals: If Fury got up two breaks against you, the game was done. Fury offense was crisp and relentless. Their players also ruled the skies and almost always came down with the 50/50 floating hucks. Fury’s best players from their weekend: Claire Desmond, Lakshmi Narayan, and Katie Ryan. – Nightlock still struggled with themselves more than their competition. They capitalized on turns by playing fast and aggressive D-line offense. Nightlock’s greatest worry was their own execution errors. Against weaker teams, it wasn’t a problem, but their game-to-go game against Wildfire had them drop three breaks in a row before Wildfire started making execution errors of their own. Nightlock has very athletic players that can get out in front of the defense and put them on the back foot. They’re at their best when the defense doesn’t have time to set up and has to play at the Bay Area’s pace. Best players from their weekend: Claire Sharman, Natasha Won, and Jackelyne Nguyen. – There should be a term for the Florida United/H.I.P./LOL strategy of destroying weak teams to earn a bid. In any case, it didn’t work out for LOL at Regionals. They played tight early for many of the games but seemed gassed late against tougher opponents. LOL struggled to close out games but played a very scrappy game that kept them competitive. The team made some big plays that seemed impossible and kept the disc alive to the shock of their opposition. LOL’s top talent can match most lines in the nation. Assuming that they can accumulate a few more solid players over the offseason, we may see three Bay Area teams at Nationals next year. Best players: Alicia White and Kate Wilson. – Condors may be a top 10 team this year. For the first tournament this season, they had a full roster and looked terrifying. They handed Revolver their closest Regionals game in years and had big contributions from their entire roster. The Condors don’t play with heroes; each person knows their place in the system and runs it competently. While each player may have potential to take over a game, they work best when they play unselfishly and pick apart the opposing defense. The ‘Dors have also cleaned up their D-line offense and are very threatening after a turn. They are a relatively young squad and willing to bid for everything. Standout players: Cameron Wariner, Jesse Cohen, and Hunter Corbett. – Guerrilla’s process will have to wait one more year. Despite coming into the tournament as the 2nd seed, they were clearly 3rd over the weekend. Guerrilla had a few too many short field turnovers that the Condors capitalized on. As a young team, execution errors are to be expected, but when playing in a game-to-go, you could see it affected their morale. Guerrilla still played at a nationals caliber level. Their offense was crisp and they moved the disc laterally exceptionally well. They always hit the open man and never held the disc too long. Standout players: Sonny Zaccaro, Lucas Young, and Ethan Falat. – Sprawl played well and traded points with the top teams in the region but was ultimately let down by their depth. Guerrilla, Condors and Revolver all could exploit their weaker talent when Sprawl’s top players needed a break. Still, Sprawl used their high energy and quick vert stack well. If Sprawl can find a few more options by next season, they may be able to punch their way into the top 3. Standout players: Travis Dunn, Nathan Bridges, Danny Bellissimo. Comments on "Regionals 2017: Recap Roundup"